What Storage Triggers and Actions are Supported? Set Multiple Values - Set multiple values stored at a defined keys. Remove All Values - Removes all values for the connected account. Increment Value - Increment a value at a defined key. Remove Child Value - Remove one or more child values stored at a defined key. Set Value If - Set a value stored at a defined key if the stored value matches a previous value. Remove Value - Remove a value stored at a defined key. Also works if the value is a list. Push Value Onto List - Push a value onto a list of values. Pop Value From List - Pop a value off a list of values, removing the value from the list. Optionally, return a default value if the list is empty. Set Child Value - Set one or more child values stored at a defined key. Set Value - Set a value stored at a defined key. Get Secret - Get your Store secret as a value for use in a Code step. This is an advanced action that will expose your secret. Use at your own risk..
Get Value - Get a value stored at a defined key. 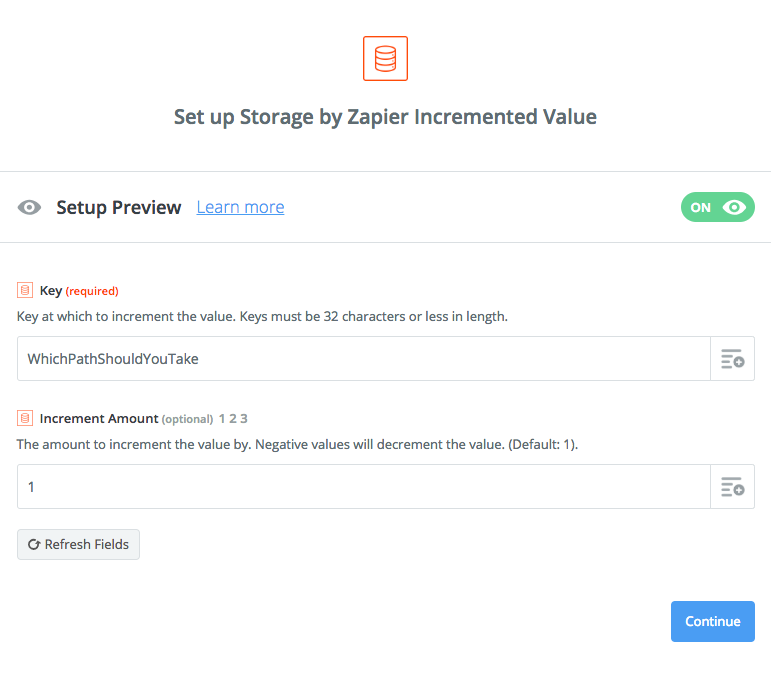 Optionally, create a new value if none has been stored. Get Multiple Values - Get multiple values stored at defined keys. Get List Values - Get all values from a list and format their output as one value. Get Child Value - Get a child value stored at a defined key. Optionally, create a new child value if none has been stored. Get All Values - Get all values stored. 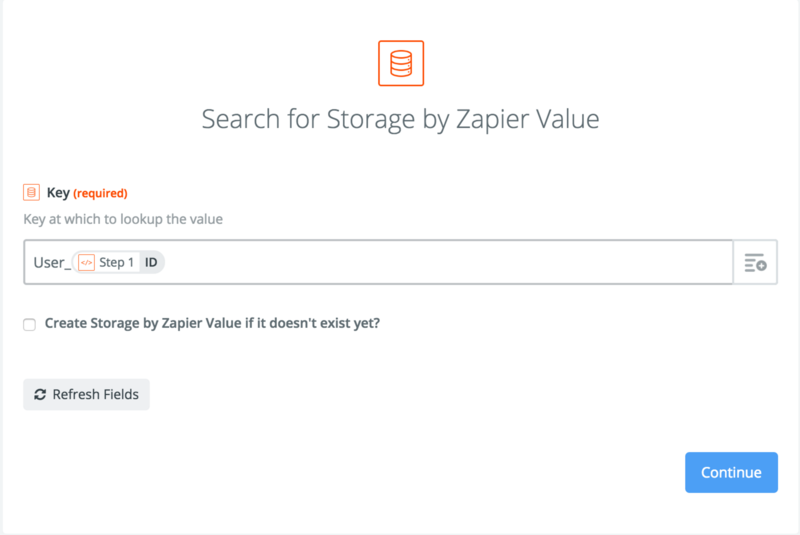 Storage by Zapier allows you to quickly store and retrieve small values of data. 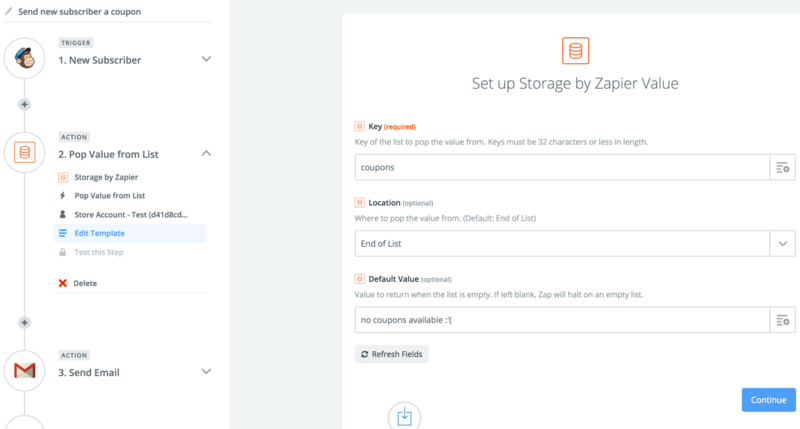 With Storage, you will be able to reference data between Zap runs or share data between different Zaps. Values are identified by Keys. A key can be any text less than or equal to 32 characters in length. A value can be any text less than 25,000 characters in length. Just as you used a key to store your value, you can use the same key to retrieve the value later. 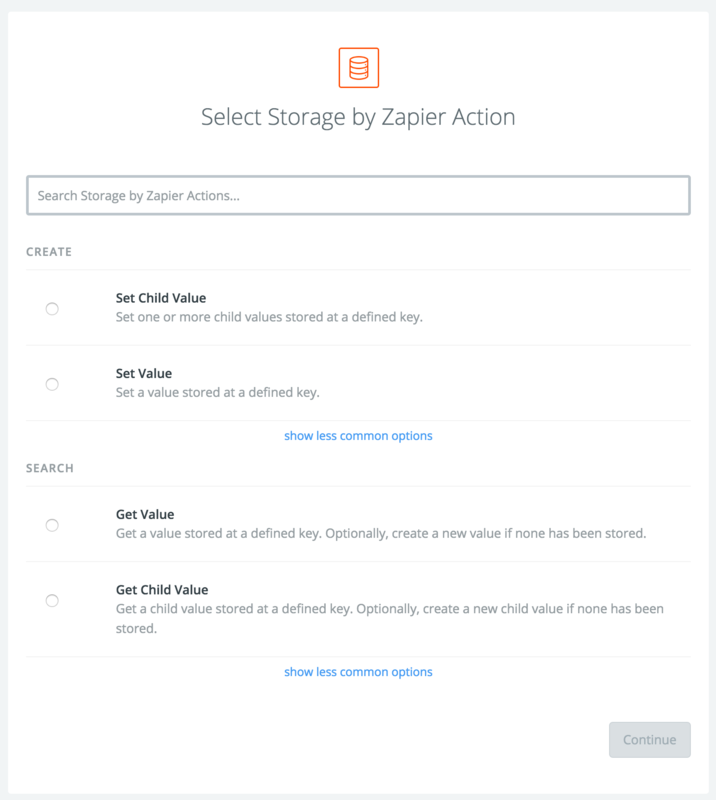 Get & Set a Child Value - Store and retrieve a value based on a key and a child key. Remove Value & Child Value - Independent operations to delete values. Set Value If - Only set a value if the current value matches a previous value. Increment Value - Store a number in a value, and increment (or decrement) that number each time by a specified amount. Push Value onto List - Add multiple values to a key in a list. Pop Value from List - Remove a value from a list. Get List Values - Return and format a list of values as a single piece of text based on a format. 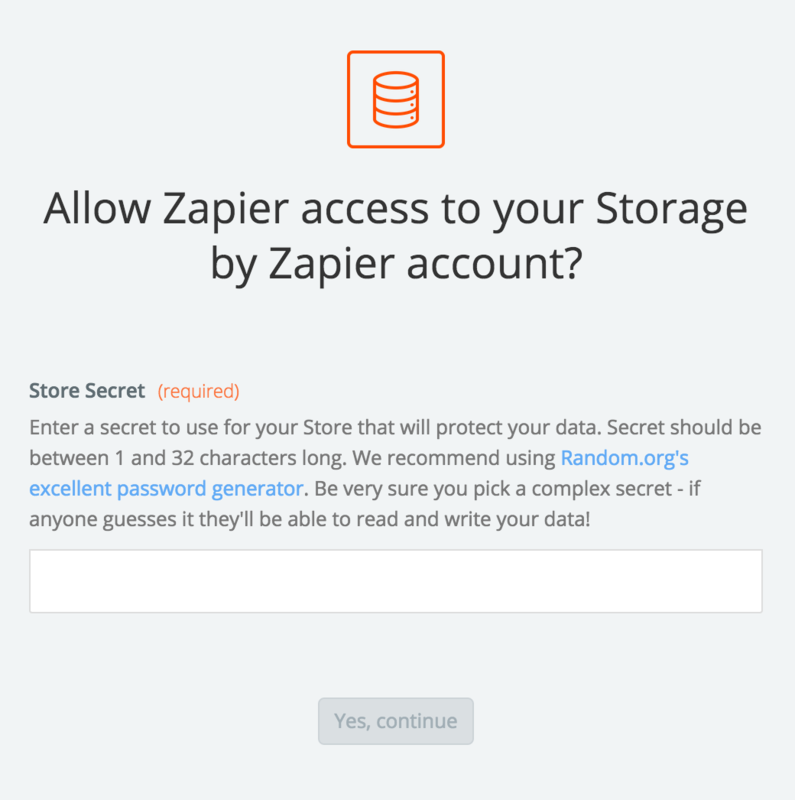 Get Secret - Get your Storage Secret to use in a Code step with a StoreClient. 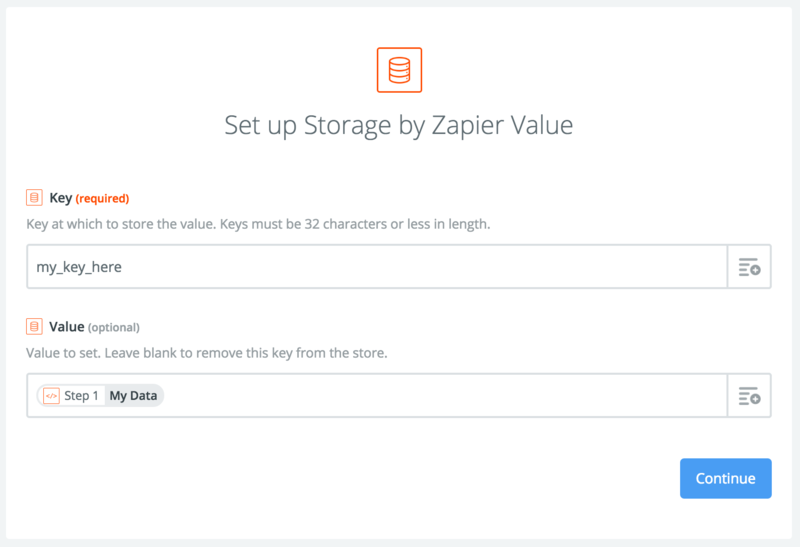 You can have more than one Storage account linked to your Zapier account. 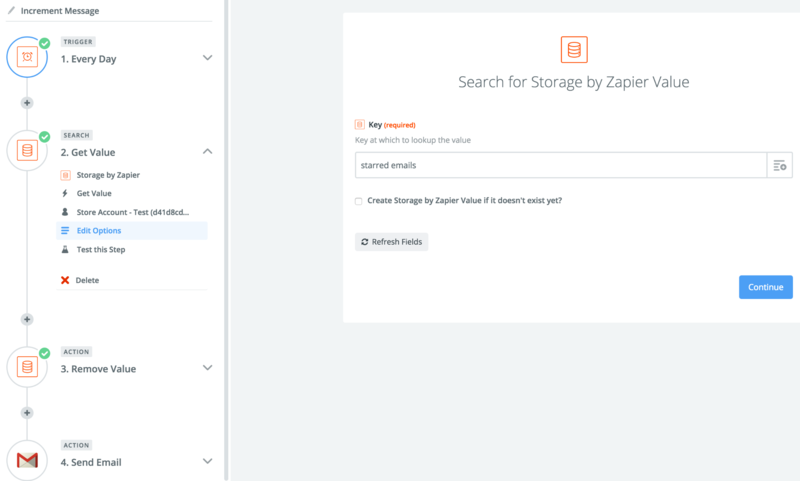 You just need to choose a unique Storage Secret for each when adding accounts. Each Storage Secret must be 32 characters or less. Each connected Storage account can store up to 500 keys. Each key must be 32 characters or less. Each key can store a corresponding value up to 25kB (25,000 bytes) in length. 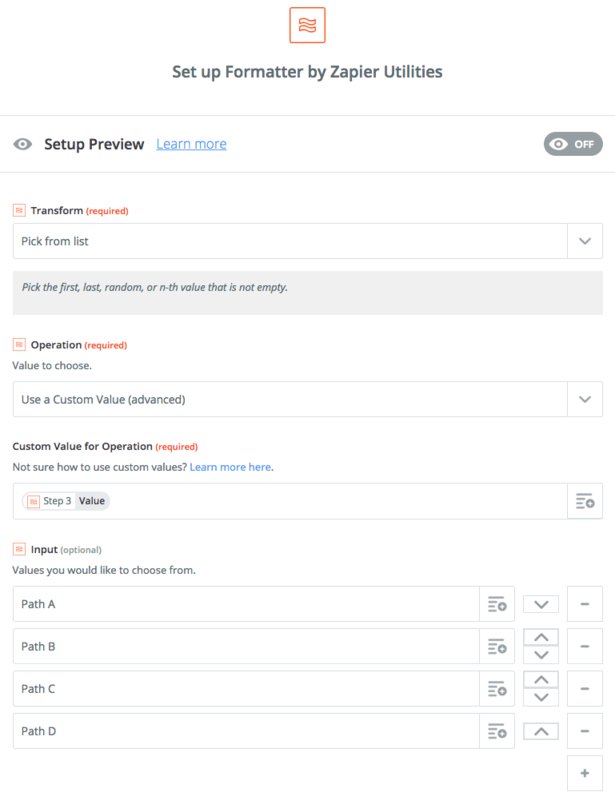 Finally, you can send the value that you pulled during the Pull Value step to whatever action that we support. 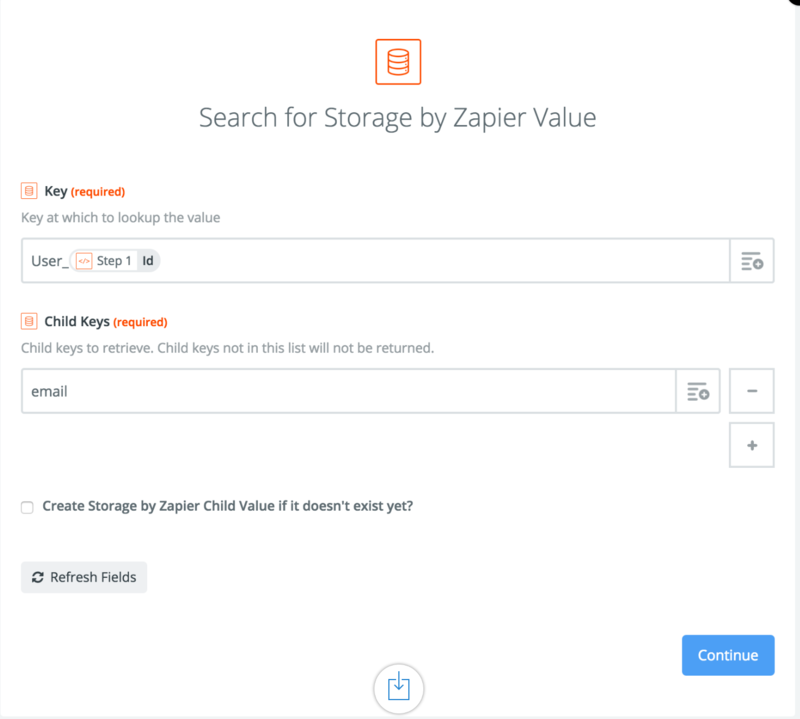 Storage by Zapier supports child values. Child values are nested values of data. This is useful if you want to be able to retrieve multiple related values at a time. Say, for instance, you’re storing information about “User_123”, including their name and email address. You could store this in a child value to be able to easily retrieve both the name and email address in one go. Round Robin is a term used when you want to evenly distribute items to everyone in the group. This means that everyone will get a single "thing" before anyone gets a second "thing". This helps to evenly distribute actions over a group. 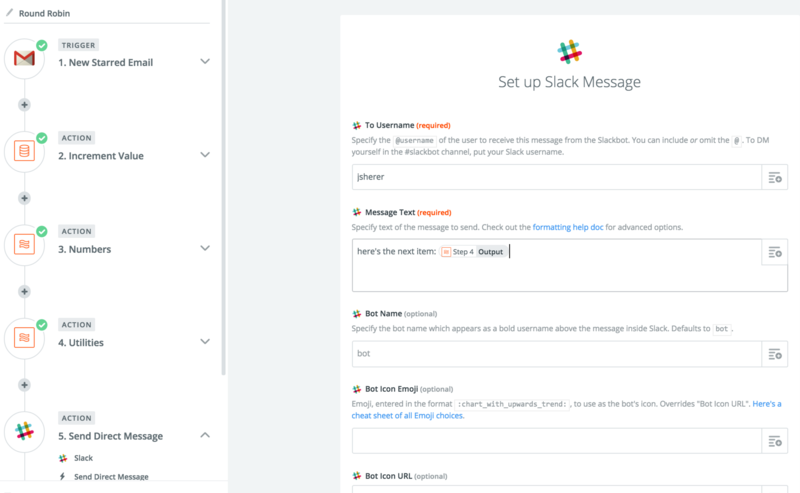 There are multiple ways to do this with Zapier. 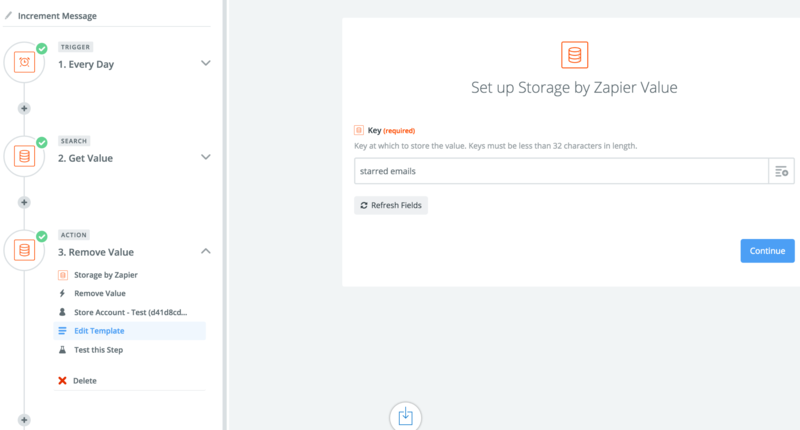 The easiest and most reliable method uses a combination of Storage by Zapier along with the Formatter by Zapier app. 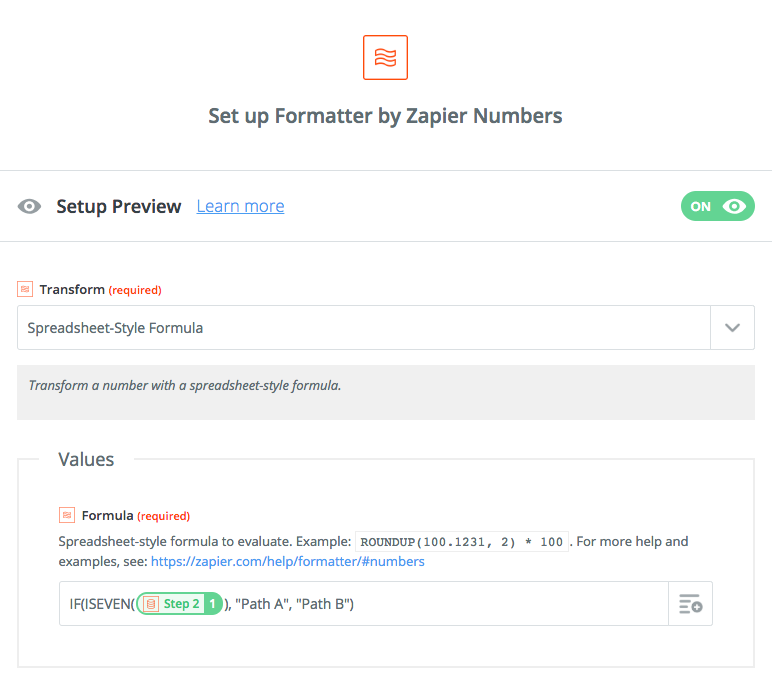 This method relies on using a Spreadsheet-like Formula in our Formatter tool. Specifically, the Modulo function. Next up, we would use the counter to perform the "modulo" of the number of items in the list. The number after the comma is however many items you want to round robin. Then, we use the modulo value for selecting which item in the list to select using the Formatter's "Pick from List" action. When the first number is 1, it outputs 1. When it's the same as the second number, it outputs 0. In Pick From List, the number 0 means the first option in the list. Because the modulo outputs 0, this works great! NOTE: Paths are available for accounts on the Professional, Professional Plus, and Teams plans. If you’re on a Free or Starter plan, you can try Paths for free for 7 days. 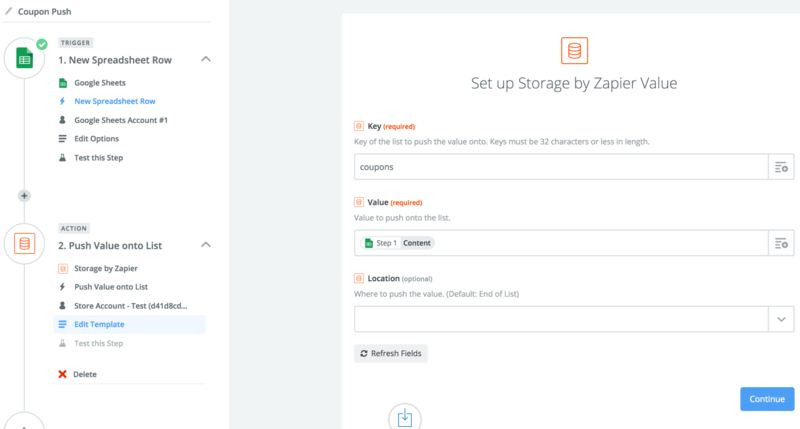 Just add a Paths step to a Zap and you can start your free trial from the editor. In the event that you want to take different actions entirely (or have an app like Google Sheets where custom values can't easily be used) you can use Paths. For the above example, you could set up one path per possible Formatter output, then add the action(s) you need within those Paths. Here's an approach you can take if you're trying to do something like divvy up leads between 2 agents, offices, etc. 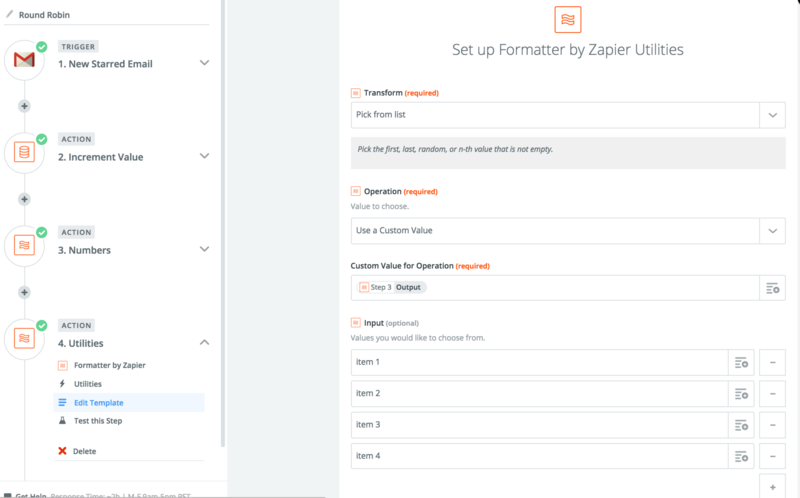 Since you've only got 2 possible paths, we can use the 'Increment Value' option in the Storage app followed by a Spreadsheet-Style Formula in the Formatter app to determine whether the value is even. If it is, output "Path A" and if it's not then output "Path B". 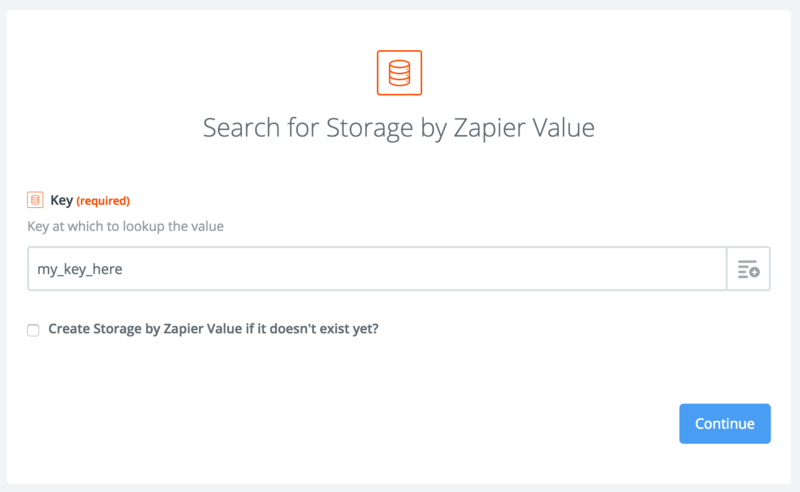 Storage by Zapier is built atop our StoreClient implementation. 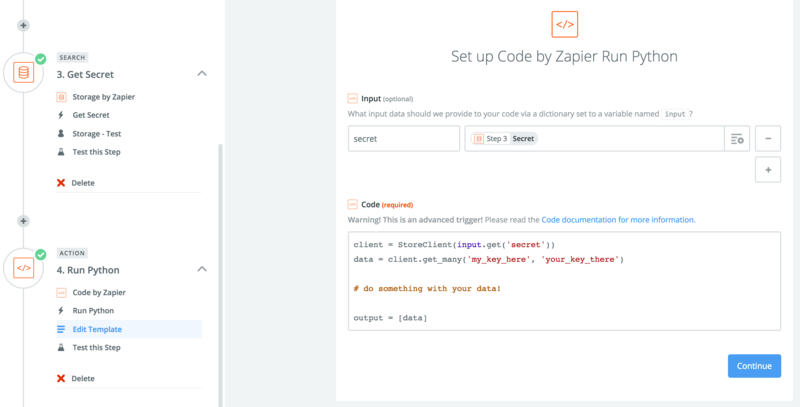 You can use the StoreClient to access your Storage by Zapier data in Code steps for any advanced functionality you might need. First, create a new step to retrieve your Storage Secret. The Zap will throw an error if the limit is reached. You'll be able to see the error in your task history.